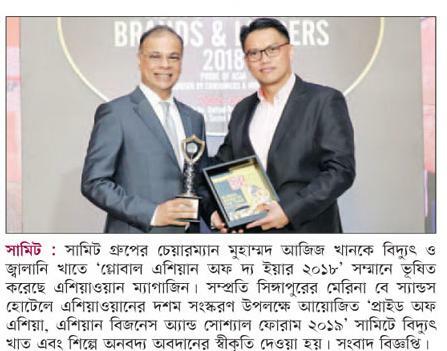 Photo caption: Mr Muhammed Aziz Khan received the Global Asian of the Year 2018 from Mr Patrick Tay, Member of Parliament (West Coast GRC Boon Lay) of Singapore. Chairman of Summit Group Muhammed Aziz Khan has been recognised as the ‘Global Asian of the Year 2018’ under the ‘Power & Energy’ category by AsiaOne magazine for his contribution to the sector and industry. The award ceremony was held at the Tenth Edition of AsiaOne Summit ‘Pride of Asia – Asian Business & Social Forum 2019’ on 21st January 2019 at Marina Bay Sands Hotel, Singapore. AsiaOne stated that, Muhammed Aziz Khan is the pivotal force of the largest infrastructure conglomerate in Bangladesh – the Summit Group of companies. Starting his business with zero capital he has been listed among the richest in Singapore by Forbes in 2018. Often called a visionary and now a living legend his business acumen is only matched by his dedication to improving lives of others, a philanthropist and avid connoisseur of art. This selection is based on primary and secondary research across 16 industries under 62 sub categories in Asia, with the evaluation and scoring from independent jury members, united research services international primary and secondary data collation and the AsiaOne editorial team. AsiaOne Global Asian of the Year is a prestigious annual nomination & selection of the most prominent personalities from the Asian continent. In the past only the 9 exclusive “AsiaOne Global Asian of the Year” have been felicitated at the “Indo-Singapore Business & Social Forum 2018” for their special work in the industry and society. Summit is the largest infrastructure conglomerate and largest independent power producer (IPP) in Bangladesh. The industries under this conglomerate include communication, trading, energy and power, shipping. Currently Summit owns 20 operational power plants in the country with an aggregated installed capacity of 1,941 MW, comprising of 21 per cent of Bangladesh's total installed capacity in private sector. Recently, Summit have taken up US$ 3 Billion investment with GE and Mitsubishi. Summit is the first Bangladeshi company in private sector to build Floating Storage and Regasification Unit (FSRU) terminal in Moheshkhali, Cox’s Bazar. Summit was awarded the Best Private Power Generation Company of Bangladesh five times in a row.